In recent posts I’ve shown how – on rare occasions – Charles Deville Wells took other people into his confidence as partners in crime, only to be let down by them most of the time. The only accomplice he could really trust was his long-term girlfriend. Up to this time Jeannette had had a particularly unhappy life: she was ten when her mother died. Her father remarried barely a year later, and he and his new bride sent Jeannette and her seven brothers and sisters away to live with various families in different areas. It seems to me – reading between the lines – that they became little more than servants. Jeannette finally escaped this situation by leaving France and travelling to England. In letters to her family back home she claimed that she had been engaged to marry an English lord; but her husband-to-be had died shortly before the wedding, and his family had shunned her. The truth, however, was that she had begun a new life with Wells in about 1890. He already had a criminal record for fraud in France, and was in the process of acquiring one in Britain, too, by fleecing investors in an elaborate scam involving patents. He already owned a number of yachts (see my blog post of 1 October 2016, below). 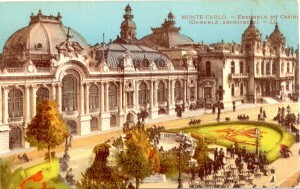 Now he purchased a colossal ship, and converted it into the world’s seventh-largest yacht, the Palais Royal. 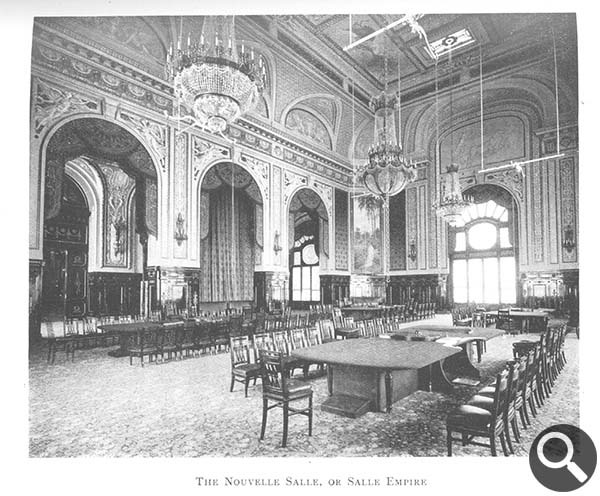 The vessel had a ballroom capable of holding 50 party-goers, and was equipped with a piano and an organ. With these instruments Wells – an accomplished musician – could entertain the guests. The accommodation was finished to sumptuous standards. Since Wells himself was (to quote a Scotland Yard document), ‘an exceptionally reserved man, frugal and simple in his habits’, it seems probable that the purpose of all of this extravagance was to please and impress Jeannette. Over the years it must have been fairly obvious that Jeannette played some part in Wells’ crimes, but the authorities – perhaps feeling that it would be difficult to prove that she had been an accomplice – did not put her on trial. Wells served several prison sentences in Britain and in France and on each occasion Jeannette was waiting for him when he was released. 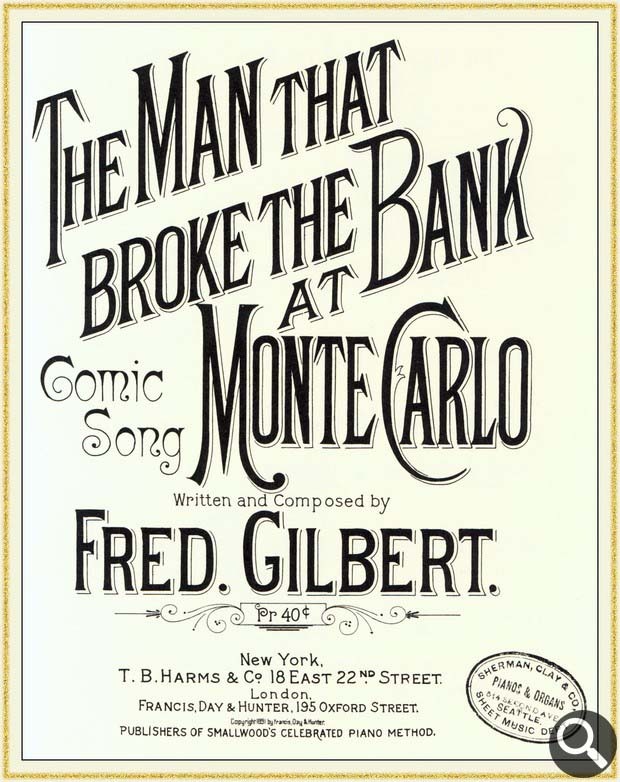 However, this routine changed when, in 1910-11, Wells perpetrated a colossal fraud in Paris, promising to pay investors one per cent per day interest on their deposits. This netted him a sum approaching £5 million in today’s values. With a suitcase full of cash and gold, he made weekly trips to London, where Jeannette placed the funds in various safe investments. Experience with his previous associates had proved to him that no-one else was to be trusted – especially with such large amounts of money. But this time the significance of Jeannette’s role in the scheme couldn’t be overlooked. She had not just known about her lover’s misdeeds, but had actually taken part in the scheme. Eventually they were both arrested on Wells’ yacht, Shanklin, and brought before a court in Paris. 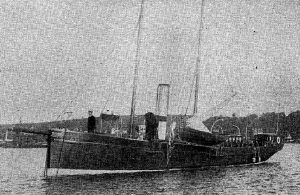 The yacht, Shanklin, property of Charles Wells. 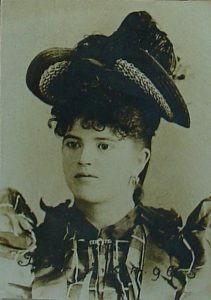 A somewhat unflattering description of Jeannette – who was now in her early 40s – stated that she had ‘the look of a little housemaid who has hit the big-time. She loudly protests her innocence.’ Intent on proving that she had been an accessory, the prosecutor asked her how she accounted for Wells having become rich overnight. She merely replied that she was not at all surprised that he was poor in 1910 and a millionaire in 1911. Wells was found guilty of fraud and misuse of funds, and received a prison sentence of five years and a 3,000 franc fine. Jeannette was found guilty of complicity, given a thirteen-month jail sentence, and fined 1,000 francs. The judge implied that he would have imposed a stiffer sentence if the law had allowed him to do so. After they completed their respective sentences there is nothing to suggest that they broke the law again. They spent the rest of their lives together, and Jeannette was with Charles when he died in the 1920s. Postscript: recently I spent a most enjoyable evening in the company of Jeannette’s great nephew and his wife. We had already been in contact for some time by email and phone, but it was an exciting moment for me actually to meet one of Jeannette’s relatives. He was very interested to hear about her later life – an episode which seems to have been swept under the carpet within the family! And for my part I learned a lot more about the Pairis family in general. Incidentally, there are no living descendants of Charles Wells himself – a fact which many financial institutions might well be thankful for. However a fairly substantial number of his more distant relatives are alive, many of them in Australia. I hope one day to make contact with some of them. Wells and Moyle placed this advertisement in a number of provincial and national newspapers. 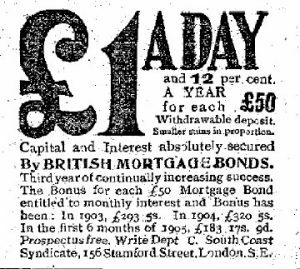 This example is from the Daily Mirror of 17 July, 1905. In 1905 two men were imprisoned for selling shares in a bogus company – the improbably-named South and South-West Coast Steam Trawling and Fishing Syndicate. 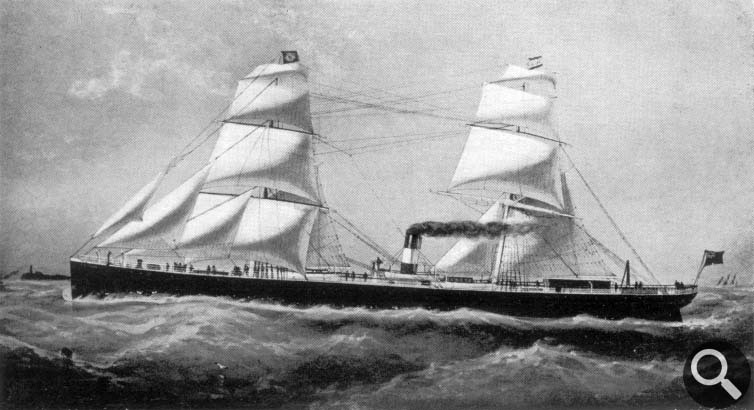 They had promised would-be investors that all funds would be fully secured against a ‘first-class vessel’, the Shanklin. In fact this boat was worthless. It had not left its berth for many a month, and had sunk at its moorings on the River Mersey. Victims of the scam included a high-ranking official of the City of London, and a Viscount with connections to the royal family. Even so, the case attracted only slight media attention at first; scams of this kind were not at all uncommon. 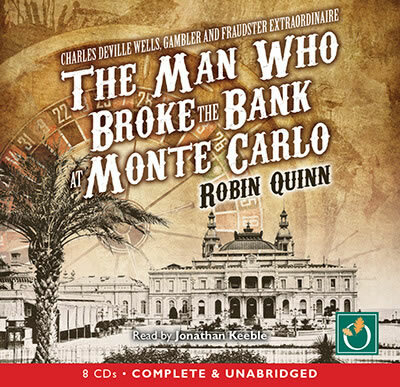 But a media frenzy erupted when it was revealed that one of the fraudsters, who went under the name “William Davenport” was in fact none other than Charles Deville Wells – better known as “Monte Carlo Wells”, the man who had broken the bank at Monte Carlo some 14 years previously. His accomplice was the Reverend Vyvyan Henry Moyle – a clergyman with a most unusual background. Some 40 years earlier he had been appointed vicar of a Yorkshire parish. It quickly became apparent that Moyle had begun to enjoy an unusually high standard of living for a clergyman. One visitor was amazed when Moyle sent a smart carriage and a liveried footman to meet him at the station. 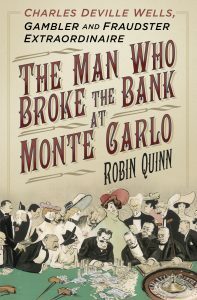 To account for his lavish lifestyle, Moyle hinted that he had come into a substantial inheritance. In fact the reason for his new-found wealth was that he had forged a substantial number of share certificates and netted the present-day equivalent of around £1.7 million. After serving a 7-year prison sentence he had been pardoned by his superiors and allowed to continue as a priest. Then, around 1904, he had met “Davenport” and between them they had cooked up another fraudulent scheme. 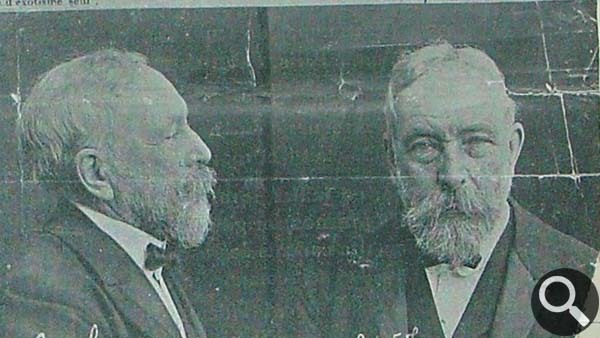 At their trial the judge remarked that Moyle was not the originator of the scheme and was to be imprisoned for eighteen months. Wells – ‘a man of very considerable ability’, according to the judge – was sentenced to three years penal servitude, a relatively light punishment, in the hope that he would reform when he came out of prison. As readers may by now have guessed, Wells certainly did not reform when he came out of prison. In fact, his most spectacular crime of all was yet to come. If this affair was to teach him anything at all it was that there is no honour among thieves, and in future he would work alone. There would be no more accomplices – except for the love of his life, his long-term mistress, Jeannette Pairis. 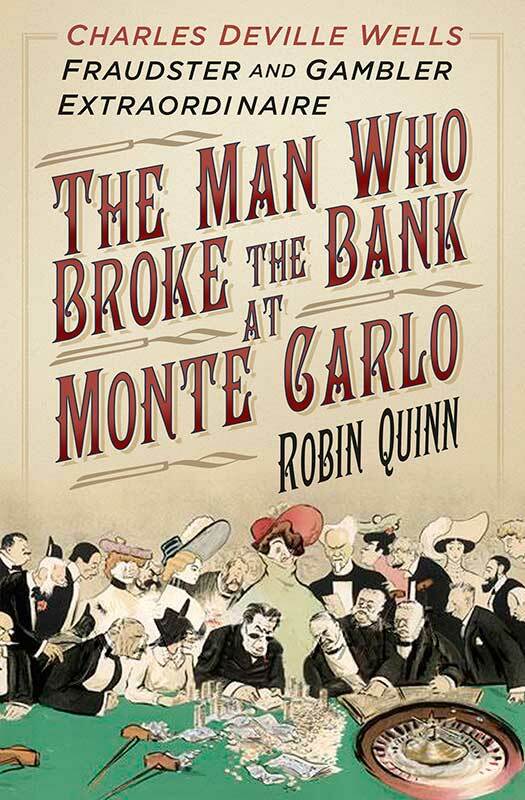 (From The Man who Broke the Bank at Monte Carlo – Charles Wells, gambler and fraudster extraordinaire by Robin Quinn). 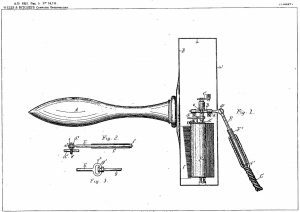 Part of the patent application for the Musical Skipping Rope jointly invented by Charles Deville Wells and Lizzie Ritchie. In the mid-1880s, Charles Deville Wells began to dream up a series of inventions including an improved ship’s anchor; a new type of parasol; and even a ‘Combination Fire Extinguishing Grenade with Lamp and Chandelier’. Few, if any, of these brainwaves met with financial success, but a glimmer of hope came along in late 1887 when he patented a musical skipping rope and sold it for £5,000 in today’s money. The British patent – number 16,711 – was jointly in his name and that of a Lizzie Ritchie, whose true identity has never been established. (A United States patent was also granted: US403556A. This can be viewed online at Google Patents). On some occasions Wells described Lizzie as his niece or as his business partner; at other times he claimed to be her guardian. In any event, her name crops up several times in his story. 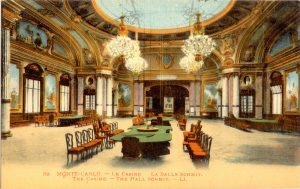 A few years later he was quizzed by officials about his exploits at Monte Carlo, where he had reportedly won the equivalent of £6 million. Wells said at first that ‘an American gentleman’ had put up the capital for his gambling, but he later changed his story and said that Lizzie Ritchie had been his backer. Under his agreement with her, he had paid her a significant proportion of his winnings. She could not come forward to back up this claim because, he said, she had married a Polish gentleman and was, to the best of his knowledge, living somewhere in Poland. 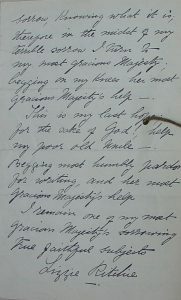 But when Wells later found himself inconveniently detained in prison, it was Lizzie Ritchie who wrote a grovelling letter to Her Majesty Queen Victoria in the hope of gaining Wells’ release. Was this really from his “niece”? Or had Wells arranged for it to be written and then posted abroad? The address at the head of the letter is in Vienna, Austria, and appears to be a genuine one. At the National Archives – where the document is kept today – I inspected it closely. The envelope is missing, so I could not check the stamp or postmark. The paper has no visible watermark, or other clue to its manufacture, but when I measured the page I found that it was of a size commonly used at the time in Britain, but not in Continental Europe. Part of a letter addressed to Queen Victoria and signed “Lizzie Ritchie”. (The National Archives). According to Wells’ family tree he had no nieces, as only one of his siblings had children, and they were all males. I attempted to locate a match for Lizzie Ritchie in the usual records, including census and birth-marriage-death data, and other sources. There were quite a few individuals of that name and – with no further details to go on – it was impossible to say whether any one of them was the person I was looking for. But one intriguing clue did emerge. As we have seen, Lizzie Ritchie had been named as Wells’ co-applicant in the patent for the musical skipping rope. Eleven years later, in 1898, a Lizzie Ritchie of Patchogue, New York, took out a patent for a washboard (Patent No. US603410A, which can be seen at Google Patents.) 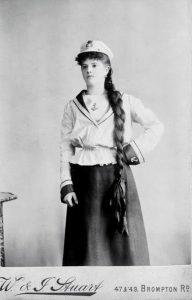 At the time of the skipping rope patent, Lizzie had been described as a British subject, whereas now she is stated to be a US citizen. However, this discrepancy could be explained by her having given incorrect information on her nationality – or she could have become an American citizen in the interval between the two patents. So was Lizzie Ritchie a real person? Or was she just a creation of Wells’ vivid imagination, whose presence he could magically invoke – like the genie of the lamp – whenever the need arose? As with most of Wells’ associates, it is unlikely that the truth will ever be known.